The weather is starting to cool, and nothing sounds better than a warm and inviting soup to warm your belly! 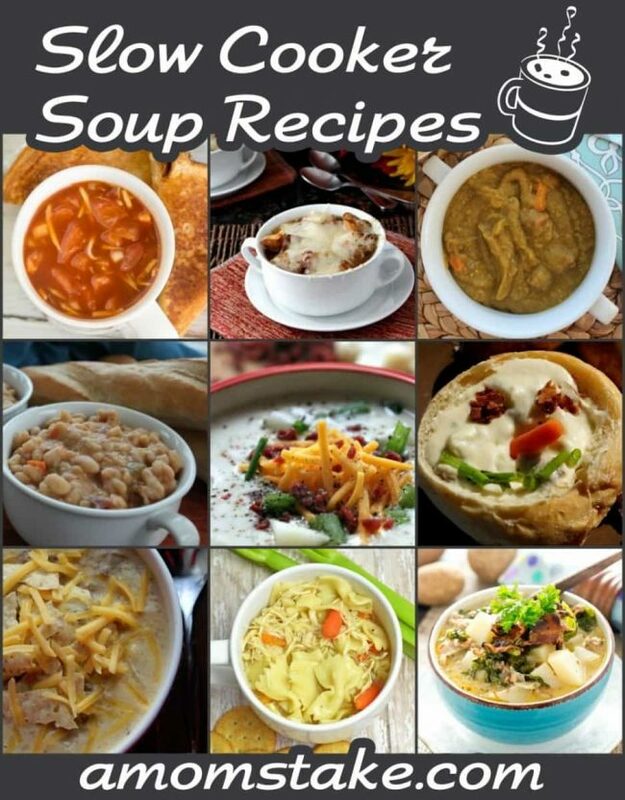 Try any of these 12 slow cooker soup recipes to have a perfect, delicious dinner ready for you with hardly any effort needed. Toss in the ingredients before lunch and dinner will be ready when you come in the door ready to thaw out from the chill of fall. Loaded with cheese and hearty onions, this soup will be a win! This delicious soup far surpasses a canned tomato soup. A healthy soup with split peas! Try a soup that’s a bit unique, like this cabbage roll soup! Creamy, delicious, hearty, and oh so filling. Sausage and lentils make a hearty soup that’s budget friendly. Potatoes are a perfect base for a soup in this easy recipe. Take a mini getaway to Italy with this yummy soup. The ultimate feel good soup will win everyone over. This loaded bean soup will give you something unique to warm your belly. Potatoes and Sausage combine for a rich soup full of flavor. Take your cheeseburgers to your slow cooker for a great soup! Which of these soup recipes will you try first? I love my slow cooker. I actually cooked in it the first day of September! This post just reminds me how often I DONT use my slow cooker. There are so many options though, I really need to get with it and try these recipes. I love using my slow cooker. It’s such a huge time saver. We love soups! All these soups look delicious. I can’t wait to try them. Man where did the Summer go? This weekend is cool and rainy here, which is perfect soup weather. These recipes look good and even better that they are slow cooker recipes. It starting to get cooler outside, and it is time for me to make my heartwarming soups and I love making them in the slow cooker. There are a lot of good ones for me to make. Thanks for sharing.